A modern twist on a classic Chanel-design inspired outfit. 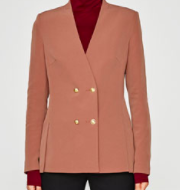 This is a classic look from Zara that you don't want to miss! Festive, Budget-friendly and Stylish, you can easily get this look and up your style game. Get this full, exact look below. Ruffle and floral blouses haven't left us for spring as it lingers among the fashion elites this season. 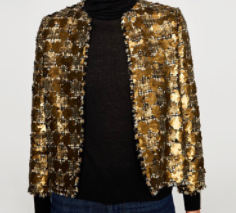 Holiday season is here, and this outfit combines ribbons, sparkled blazer, pearls and gold button with color palette of beige, black, blue, pink, silver and gold. What's not to love? It all comes together as a chic, classic look that's easy to find and easy to wear. This cream ruffled blouse is light, airy and classy. With its pearls and ribbon (which is securely attached to the back of the blouse) makes a perfect top to recreate the Haute Couture-inspired look. I layered this with this black tweed skort with beautiful gold buttons, making it a great festive season look! 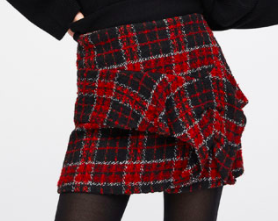 The skort actually has a built-in shorts with a zipper, so if you're wondering if it's too cold for the season, no worries. 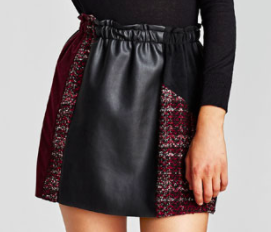 With two layers, this skort is warm and cozy, so don't be afraid to wear it this winter. Of course, the item to top it off is this tweed, sparkling blazer, decked out with beautiful large pearl buttons. I love the fit of this blazer. It's fairly true to size but may run slightly big for some. Lastly, I paired my thigh-high boots (see similar here) or suede / velvet booties like this one. Shop this look below and more similar items! What designer inspires you this holiday season? Stay tuned for more trending F/W '17 pieces right here on FirstandSeven.com. As usual, I'll be posting outfit ideas + fashion tips + recs over the weeks! (Just follow my FB & Instagram to stay up-to-date and get alerted for the new edits, eaasssyyy peeezzzyyy). Feel free to comment below or comment on my Insta or FB and if there's a look you want to see more of, let me know!